It seems nothing can stop the freight train known as Samsung, which gave a glimpse into its record-breaking first quarter with an expected US$45.9 billion in sales. Samsung released its quarterly guidance Friday to offer an advance peek into how much all those gadget sales amount to, and the numbers are whopping. The world's top smartphone vendor appears to be taking no prisoners, expecting to take in an operating profit of nearly 8.7 trillion Korean won (US$7.7 billion), up from approximately 52 trillion Korean won (US$45.9) in sales. If all the chips line up, those figures would set a new first-quarter record for the Galaxy device maker, exceeding the predictions of many analysts. Samsung traditionally offers such earnings guidance ahead of its official quarterly earnings results, which won't be disclosed until approval by its Board of Directors. The post-holiday quarter is traditionally slower for consumer electronics companies, making Samsung's more than 50 percent increase in operating profits a nice way to kick off the new year. 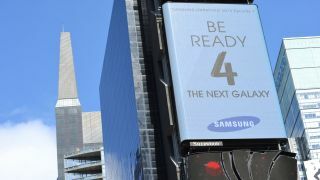 The best is yet to come, with this year's flagship Galaxy S4 handset starting to ship by the end of April, which should help lift Samsung to even loftier heights for the second quarter. While Samsung notes the estimates announced Thursday "may differ from the actual results," the numbers seem to be a clear indicator the South Korean giant will continue to dominate the smartphone market for the foreseeable future.